Virginia football head coach Bronco Mendenhall addressed the media as he does every Monday of a game week. This week, though, his Cavaliers are looking to rebound from a 23-13 home loss to Pittsburgh last Friday night. It was the first time in over a month Virginia had suffered a defeat. In what will be the final home game of the 2018 season, the Hoos host the Liberty Flames in a non-conference matchup in Scott Stadium on Saturday, November 10 at 3 p.m.
Paraphrased as always, below are notes from Mendenhall’s November 5 press conference. We will add the full transcript later on in the day. An obvious concern stemming from the Pitt game was the future status of Virginia defensive starters Juan Thornhill, Joey Blount and Mandy Alonso, who all left Friday night’s contest with leg injuries. Thornhill, a safety, returned to the sideline with a boot on his left ankle, while Alonso, a defensive lineman, and Blount, a safety, returned on crutches. Additionally, safety Brenton Nelson, who is not a starter but plays major minutes regardless, was banged up versus Pitt but managed to stay in the game. Mendenhall is anticipating Alonso being out for the Liberty game. As for the other players (he was specifically asked about Thornhill and Blount), the Cavalier head coach says there is hope; however, no one has been confirmed in or out. Alonso’s absence was confirmed on UVA’s newly released depth chart. The Miami (FL) native does not appear on the chart, which shows Aaron Faumui (DE), Jordan Redmond (NT) and Eli Hanback (DE) as the starting defensive linemen. Tommy Christ (DE) is backing up Faumui, Dylan Thompson is backing up Redmond, and Faumui is backing up Hanback. Thornhill is in his usual place as a starter, but it’s worth noting that Blount OR De’Vante Cross are listed at free safety. – Given Alonso’s injury, the spotlight shifts to defensive line coach Vic So’oto and having someone else emerge at the position. This must happen immediately, Mendenhall said. – Alonso’s absence could impact how other positions are used. The coaches, as always, are looking to find the best 11 players to put out on the field. – In light of the rash of injuries at safety, Mendenhall was asked about the progress of true freshman safety Joseph White, who starred at Landstown (Virginia Beach, VA) before enrolling at Virginia. White saw his first action of the season (on special teams) last Friday night. This could change based on injury, but right now he is only being considering for special teams. Mendenhall said he earned playing time on special teams and has done a really nice job there. Mendenhall added that the roster is getting thin, as it did at around the same point last year. Eventually the program will get to the point where, at every position, there is a next guy up and ready to step in. – One final roster note – Mendenhall said the staff is trying to “protect” true freshman quarterback Brennan Armstrong from burning a redshirt this year. Armstrong has played in two games so far. He can play in four and still preserve the redshirt. 1) Virginia’s defense misfit two run plays – no doubt he meant Darrin Hall’s two long touchdown runs. 2) Virginia’s defense didn’t respond to the momentum shift on the horse-collar penalty on Pitt’s second offensive drive of the second-half. Sophomore linebacker Elliott Brown, who has just started to see his playing time increase, was flagged for a personal foul horse-collar while sacking quarterback Kenny Pickett on 3rd-and-11 from the Pitt 15. The penalty gave the Panthers a first down. They proceeded to score a touchdown on the drive. Mendenhall noted that the UVA defense had three other third down situations in which they were not able to get off the field on that same drive. 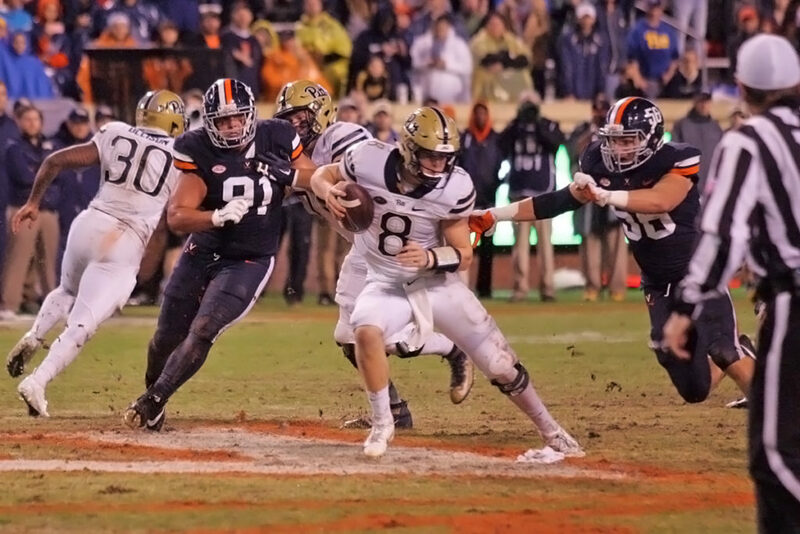 – Brown’s penalty was an effort-based mistake, which is a lot easier to take than the mental mistakes (such as the false starts) UVA also made versus Pitt. Those mental mistakes bothered Mendenhall. – Virginia got the Pitt team that played Notre Dame – the Panthers lost in South Bend but shut down the Irish rushing attack and controlled much of the game – as opposed to the team that played Duke and surrendered 45 points. Pitt won the latter in a shootout. Mendenhall wanted the team that played Notre Dame, but Pitt simply beat Virginia at its own game. – There is plenty for his team to still to play for, Mendenhall noted. The focus first is on Liberty and then fighting for the ACC Coastal. – Mendenhall took note of Liberty’s passing attack – the Flames average 323.9 yards per game – and scoring offense – the Flames are averaging 36.9 points per game – as statistics that jump out. He says Liberty has a nice scheme design, talented players, a clear identity and speed with which they want to play. – Alternating from conference play to a non-conference opponent is a challenge, Mendenhall said. While the feeling will be different, he says his team has so much to work on and so much to play for that he anticipates the players accepting this as a great opportunity. – Senior wide receiver Olamide Zaccheaus had only five touches versus Pitt. OZ’s number of touches reflected the way the game went in terms of lack of production and lack of points. The offense simply struggled to get on track. – The offensive line has improved in terms of culture and performance, and without this improvement the team wouldn’t have the success they have had this season. Still, the unit is away from where Mendenhall wants it to be. It’s not as deep as he would like it to be. – Mendenhall spoke to the team on Saturday and told them the run offense cannot just be quarterback Bryce Perkins on read option or a scramble. Those plays have to be a complement to the core run plays featuring Jordan Ellis. The offense needs to get the senior running back going. – Mendenhall was happy for sophomore wide receiver Terrell Jana, who has continued to work hard despite limited playing time. Jana’s work paid off with three catches for 71 yards and a touchdown against Pitt. – Junior inside linebacker Jordan Mack returned to a starting role last Friday night. Of Mack’s performance, Mendenhall said the Georgia native showed effort and desire but not precision and consistency. In other words, it looked like Mack’s first game back. Mack mentioned postgame that his performance wasn’t up to his standards. – Coach Mendenhall is a fan of punter Lester Coleman. On the field, Coleman has gained his trust with time and consistence performance. Mendenhall also highly praised Coleman’s character. If Lester needs a reference, he said, the hirer better be ready for a long conversation. Nothing but praise for Virginia’s starting punter the past two seasons. – Coleman has successfully incorporated rugby-style punting in his game thanks to help from special teams grad-assistant Drew Meyer, who punted at Wisconsin. Mendenhall wanted to incorporate rugby-style punting because it is more difficult to return. – Senior long-snapper Joe Spaziani arrives at McCue at 4 a.m., before the coaching staff. The son of football coach Frank Spaziani, Joe is passionate about the game, self-improvement, and he loves studying to improve his craft. The senior not only practices snapping but also assesses the offense and defense. He’s driven to learn, and Mendenhall thinks it will be a long time – if ever – the program sees another like Spaz. BRONCO MENDENHALL: First regarding closure to our game last week, after reviewing the film and just being very thorough about the analysis, the game was pretty simple in that Pitt won both sides of the line of scrimmage. That really was where the difference of the game emerged, especially in the second half, I believe. And my philosophy is that there are three to five plays, and well researched, that determine outcome, especially in games of parity or conference race games, whether it be in the NFL or college. That game was no different. We misfit two run plays that both scored. After first down we turned the ball over on a drive that was necessary. And so that would be three of the plays. Then just simply didn’t respond to a momentum shift on a penalty. So you take all the snaps and all the football that was played, those four plays really were pivotal in the outcome. Lots to be learned from those, with the underlying theme being the execution by Pitt. Their offensive and defensive fronts ended up in the second half determining the outcome of the game. Having said that, lots to work on to improve. I love the idea of controlling what we can control and focusing on improving our football team this week with urgency; knowing there is just a three-game stretch left before postseason and how much improvement and how much success can we have within that time frame; knowing there is plenty still to play for. I would love to have a great outing at home to finish this season. Very appreciative of our fans, and a noticeably different feeling in Scott Stadium this year to me in terms the energy, the support, the student section. There is a noticeable difference. For me to notice it on the sideline is pretty significant. I have felt it and seen it and acknowledged it. I’m so appreciative, and would love to have that finish this season appropriately for everyone. And then going forward, yeah, fight right to the end for the Coastal in the next two games after. Now having said that, I really won’t address anything other than the Liberty game going forward. That’s what I’ve shared with the team. Now our focus is to play the best football we can this week with that being our only focus. Q. When you have a young player like Elliott Brown who hasn’t played a ton from scrimmage and he is in position to make a really good hustle play, and then at the last second he does something he probably didn’t need to do and will not do again. What do you tell him after a play like the horse collar? BRONCO MENDENHALL: It just simply is a learning experience. It was an effort-play, as you mentioned, and I am a will-before-skill coach. Sometimes the growing pains that come through experience are for everyone to see and it impacts the team. That does not mean it determines the outcome. I think there were three other third downs on that drive where we had a chance to get off the field. But in the context of that was just a significantly emotional play that as our program builds and matures we have to be able to then, that’s over, reset, reframe, and finish, which on this particular drive we didn’t do. And so learning experience, which is hard to simulate or create in practice, even though that’s our intent. In that moment, just didn’t quite — the roots weren’t deep enough from practice to the game and made an effort-based mistake. Easier to take those than the concentration mistakes and false starts and different things that were happening early in the game. Those to me actually bothered me more, significantly more, than that one. Q. Coach, we realize you have to play whomever is on the schedule. Is it a unique challenge to grind into Coastal in ACC play and then play a nonconference game this late in the season? Just that dynamic. BRONCO MENDENHALL: Yeah, it’s a unique challenge — and it doesn’t mean bad or good, but it is a challenge. Having been an independent before, very few teams that were involved in conference play wanted to then break and schedule an independent. We usually found the most success or anyone wanting to play us at the beginning. It was harder to find those games at the end. So it’s a challenge. Again, it’s an opportunity to improve our team and play football again. But to not acknowledge it would not be truthful. Yeah, it is different. But, man, we have so much to work on and so much ground to make up and so much to play for though I don’t anticipate that being now anything other than a great opportunity. Q. [Olamide] Zacchaeus only had five touches I think the other day. Is there a better way of getting him more touches in games? BRONCO MENDENHALL: Certainly, and has to have more touches. We know that our offensive production as well as our team — an opportunity to win is tied not exclusively, but has a lot to do with Bryce [Perkins] and Olamide. Those are our two most dynamic and productive offensive players. And so we just simply struggled to get on track, find rhythm, find momentum and assemble the continuity of a plan that got us the points and yield that we needed. And so number of touches kind of reflects just the wait game went in terms of lack of production, lack of points, and what I believe is we got the Pitt versus Notre Dame team; we didn’t get the Pitt versus Duke team in terms of style of play, which we expected and kind of wanted that. We just thought we would win that type of game. They made a couple more plays than us and ended up kind of beating us at our own game. Q. Do you have any updates on Mandy Alonso, Juan Thornhill, Joey Blount? BRONCO MENDENHALL: We’re anticipating Mandy Alonso being out, and so that’s just short of the being confirmed, but anticipating that. All others I would say are hopeful and have not been confirmed and been ruled in our out. Q. And Dylan Thompson kind of got some run there with Mandy being dinged. What have you seen from him and where is the confidence level in him? BRONCO MENDENHALL: I just saw a start. Dylan, in terms of where our preparation and culture and our intensity and effort level is and my expectations, there is — he’s still not to that point. He’s becoming closer, and all that happens now with Mandy is that Coach So’oto and the defensive line, the spotlight goes directly to them and the urgency to emerge — have another player or other players emerge for us. We’re out of time. That has to happen immediately. Q. As you look at Liberty on film, the passing game really has to stick out. [Stephen] Calvert’s a record setting quarterback. The receiver, Antonio Gandy, is a big physical guy. What stands out there and what does the secondary have to do to kind of keep that in check? BRONCO MENDENHALL: What stands out is production. Liberty is ninth nationally in throwing the football, I think 26th in scoring offense, and so the statistics jump out. Not hard to see on film that they have some talented players, a nice scheme design and are very clear about what their identity is and the speed in which they want to do it. Q. I think you’ve said that you thought the offensive line was better last season than it was your first year, and there may be more incremental progress this year. How far are you on that front from getting the O-line where you want it and need it to be? BRONCO MENDENHALL: Yeah, we’re still a significant ways off, but we have improved from a year ago in not only culture and performance. But, again, that’s moved the meter. I don’t know where to put it in terms of letter, grade or percentage, but it is moving. Not as fast as I would like it. We’re not as deep as I would like. The mindset and execution as well as the strength and size is still a work in progress. But we are improving, and that’s the only way our record and our — the program movement can and has happened to this point is due to some of their improvement. Q. Against a Liberty team that gave up I believe 777 yards lasts week, how important is it to get Jordan Ellis back to where he was? BRONCO MENDENHALL: It’s really important. It was one of the — we met on Saturday as a team having played on Friday just to put the past game or the Pitt game to rest and finish all that so we didn’t have to do double duty on Mondays like we normally do. We met and that was one of my points of emphasis to the team. Our run game can’t just be Bryce on zone read pull and then quarterback scramble. That can’t be the majority of the yards. That can be complementary, but it has to come off of run game execution off our core plays. Right now it’s shifting in reverse order. So it has to happen for us to have the success we want down the stretch. Q. With Saturday being Senior Day, a lot of unsung guys seems like in this senior class who have just stuck it out and done their part as you kind of get this thing going. What have those guys meant to this program? BRONCO MENDENHALL: They’re everything. They’re the glue, the mortar, the things that have held things together. When some of the higher drama personalities want to go up and down, they just keep working. Then when there maybe a great win, they just keep working. When there is a tough loss, they just keep working. So the consistency and the embodiment of the core principles of the program, those guys are just unwavering. It’s been essential to the progress that we have made and we are making. I’ve just been really fortunate to find and to have a group of young guys allow me to coach them and trust me and our methodology, which is difficult. It hasn’t been easy for any of them. They’ve embraced it as their way, and I’m really proud of them. Q. You talk about the unique challenge late in the year of a nonconference game. Coming off a loss is it a little bit easier to get your team ready for a game like this and focused on things they have to work on? BRONCO MENDENHALL: I’m not sure if it’s easier, but any of us in this profession, there is high stakes and high pressure. None of us like to lose. That feeling isn’t something you want to linger. So there is an urgency added regardless of the next game where you want it to go away, that feeling. So I think for any staff, any program, any players, that’s a typical response. You just want that feeling to go away and replace it with something better. Sometimes who you’re playing helps; other times it’s just we just need another game as fast as we can play. Where our team is I’m not sure other than we want to play again as fast as possible. Q. One of the things Lester [Coleman] mentioned is you first get here and put in your style and the way you do things. It wasn’t for everybody, right? Some guys left. What do you think made Lester Coleman somebody that stuck? Was there a point early on that he kind of won you over and you said, Okay, this is one the guys I want to hang around? BRONCO MENDENHALL: The collective body of work is what wins me over. I think trust is established with time and consistency. So for anyone in our organization, if you’re looking for a winning-over moment, that’s a waste of time. But if you look to now daily, week in and week out and day in and day out and year in and year out, just working and showing up and doing what’s asked with a great attitude and leadership and helping others do the same, then overtime, yeah, trust is established. I can’t name the day, but certainly trust has been earned by Lester from me. Man, he’s an amazing young person. When letters of reference or endorsements come, they better have a long time on the phone if it’s a call. He’s going to get whatever job I’m recommending him for. Q. What do you like about him? BRONCO MENDENHALL: There is nothing I don’t like. Every admirable quality you can consider I think I’ve seen him demonstrate or manifest that in a real natural and authentic way. I’m a fan. Q. Regarding this game, had it been scheduled before you got here, what was your involvement? Who do you know over there? What do you see as the future of this series? BRONCO MENDENHALL: Yeah, I think that the game was schedule prior to my arrival. I did not have any involvement in the scheduling from what I recall. Turner Gill, the head coach, serves on the board of trustees for the AFCA, as do I, and so we’ve gotten to know each on the past number of years. But other than that, there is nothing that I’ve been part of in terms of the game. Q. Do you like the idea of having an in-state propram like Liberty to play? BRONCO MENDENHALL: Yeah, I like the idea, again, of — in terms of scheduling philosophy, close and regional. And intriguing. It makes a lot of sense. So in our own state it certainly makes sense. Where and how it goes from here we’ll certainly see. Scheduling happens, as you know, five and sometimes six and sometimes seven years in advance. So I haven’t even looked past this game if the series is to continue or if this is a one-time. I haven’t looked. BRONCO MENDENHALL: Okay. So there you go. Right now I know it’s Monday, and that’s about as far as I’ve looked. Q. Are there freshman who have not played this year who in your first two years you would have used because you didn’t have the depth or needed what they bring? I’m just curious kind of your overall thoughts on this class. BRONCO MENDENHALL: Yeah, I don’t think so. And, again, if I had all the names in front of me I might change my answer. But a year ago 17 of those first years played, which from what was passed on to me, that was the fourth most in college football. Our roster now I’ve heard is sixth, seventh or eighth youngest. I don’t know which of those is accurate, but we’re playing anyone that can play and help our team progress and move forward. So I don’t feel — in answer to your question — that there is any position or player that we can say we’ll hold and wait for another year. We’re not to that point. Intentionally we’re working as hard as we can to protect Brennan Armstrong at quarterback. We would love to have him and not count this year. That would be the only circumstance where I would say there is an exception to where the roster is. BRONCO MENDENHALL: He’s a special teams option only at this point. Now, that might change based on injury and who comes back and who doesn’t, but right now I’m considering special teams only. He’s earned that right. He’s done a really nice job to this point this season. Again, it’s not accidental where the roster is getting thin right now. It’s about the same time it started to get thin a year ago. Maybe we’re a game or two longer, but that’s exactly where we are. That game in particular on the defensive side we took some pretty significant hits at key production positions. One is possibly replaceable; two is difficult; three is really hard. So, yeah, we’re trying to get those guys back as fast as possible. Eventually this program just the next guy up will step in and be ready. We’re not there yet. Q. Lester was talking about the transition from traditional punting to rugby style punting. I don’t know how much you look at other programs, but Harrisonburg, Jamie has had a pretty good success the last two years with a young Aussie Rules punter. Did you guys talk to him or reach out to anyone about making that transition? If not, what led to the transition? BRONCO MENDENHALL: What led to the transition was yards per return. It’s much more difficult to return rugby style punts than traditional punts. That’s demonstrated in our yards per return right now. I think our opponents are under three yards per return. It’s almost not possible to return a kick against us right now with the formation that we’re using and the inclusion of some rugby. So that’s the primary purpose. Someone that’s been really instrumental in helping the rugby transition is Drew Meyer, who is a graduate assistant, former punter at Wisconsin. So he is a graduate assistant that works with our kickers and punters. Under Ricky Brumfield’s direction. Drew has been really helpful through his connections. Kickers are all tied together somehow, some way through all the different camps they’ve been to, and Drew is part of that. I don’t even know what to call that kind of conglomerate of kicker society. That’s how we’ve done it. Q. Lester gave us some information on [Joe] Spaziani who will be in here later. He can be found in the locker room at 4 a.m. and other stuff. Can you talk about him a little bit? BRONCO MENDENHALL: Yeah, Spaz is there before our coaching staff. That’s hard to do because we get there early. He’s the son of a football coach and he’s passionate about it. He knows early hours. He’s passionate about self-improvement. He loves to read and is always studying how possibly to improve his craft. During practice he’s not only snapping, but he’s assessing our offense, defense, scheme, strategy. He’s asking me questions that just — yeah, like an analyst basically. He’s just really fun to be around. He’s just so driven to learn. I like those that are just driven to improve. So, yeah, it will be a long time before we have another one like him, if ever. Q. You mentioned that you’ve been independent before. Can you kind of speak I guess to what little relationship you do have with Coach Gil at this point and also the level of respect for an independent program? BRONCO MENDENHALL: Yeah, so Turner and I through the board of trustees we’ve become friends. When Liberty chose to go independent we had a dialog. I don’t remember the exact details, but he knew that I had been at Brigham Young and we had been independent. I just passed on some of our experiences, some of the strengths, and some of the challenges that are part of being an independent. It’s just been fun to get to know him as a person, which I always look for quality people in the coaching profession. I think he certainly is. I just respect his record in terms of coaching, but more importantly just who he is. I think he’s exceptional and just a really good person. Q. With Mandy not available, what does that change for? I see Jordan Redmond back at nose tackle; Eli [Hanback] at end. Does that change things for you beyond the defensive line? With Jordan Mack back, does that mean anything for the back seven as well? BRONCO MENDENHALL: It certainly could, that’s what the defensive staff is a doing right now. Again, our philosophy is put the best 11 defensive players out on the field that match the circumstance and situation that they’re presented with. So that’s all being assessed right now. That dynamic just changed based on some of the injuries in the past game. So, yeah, it certainly could affect other positions besides just the defensive line. Q. On Jordan Mack being back, what did you see from him on film? BRONCO MENDENHALL: I saw effort and desire but did I not see precision and consistency. So looked like his first game back is what it looked like. Q. You had a few other receivers involved in the passing game this past week. Was it what you had hoped for or still work to do? BRONCO MENDENHALL: Still work to do. But I was happy for Terrell Jana. He’s kind of labored in the background and has been consistent and just worked and worked and worked. To have a few targets go his way and for him to have some production, it’s needed. We’ve been looking the entire year for a complement to Bryce. Olamide, Hasise [Dubois], we’ve been trying to find one other contributor. At some times it’s been Joe Reed; at some times it’s been Tavares Kelly; last game was it Terrell Jana. So we’re still hoping there becomes a more consistent performer opposite those others. This week we’ll have a lot to do with who fills that role for Saturday.